8-Bit Girl: Kirby TV lands on the Wii! Kirby TV lands on the Wii! 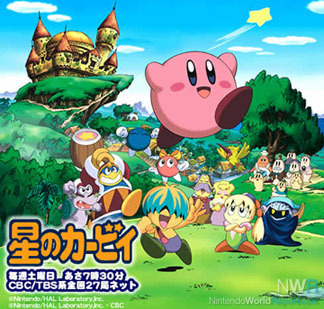 Available to grab on the Wii Shop Channel from the 23rd June 2011, Kirby TV is a free download that allows Wii owners to watch episodes of Kirby: Right Back At Ya! which has never before aired in the UK. It is a limited service, which will run from the 23rd June up until the 1st December 2011, when the final episode will be aired. Four episodes are available at one time, and will be available for 14 days before locking. It appears that a lot of episodes will be available throughout the 5 month run, as two new episodes are released each week on Mondays and Thursdays. For anyone who finds themselves enjoying watching this pink puffball, 14 days is not really a significant amount of time if you've let the episode list stack up! Thankfully though, there is a way of checking out a missed episode. Watching an episode will occasionally award you a key, which will allow you to re-watch an episode from the archive that is now locked. Currently available episodes are featured on the "Now Showing" section of the channel, and each episode number is displayed with variety of cute Kirby illustrations. I personally have trouble streaming videos from the Nintendo TV channel, and rarely do I make it through a whole clip without it re-buffering, freezing or halting completely. This is incredibly frustrating, and as a consequence, I rarely ever check this channel out any more. Thankfully, Kirby TV appears to stream brilliantly, and the picture and sound quality is also very clear. The cartoon itself is, as you will probably expect from Kirby, very family friendly. Kids will love watching Kirby in a series of adventures with a whole host of brand new friends, but in all honesty, it's lacking a little for adults. While there is plenty of cuteness and charm, Kirby: Right Back At Ya! is a little too overbearingly cheesy for the most part. The animation is good enough, and the English dubbing (this was originally in Japanese) has been done rather well, but there is something not quite right about the look and animation of Kirby's nemesis, King De De De. Although fans will be able to tell it is him, he just looks a little "plastic." However, minor criticisms aside, this is an excellent idea from Nintendo, and it would be great to have more free channels such as Kirby TV to indulge in.